This article originally appeared in The Greenwood Tree, the journal of the Somerset and Dorset Family History Society, August 2014. It is reproduced here with the agreement of the Editor. For information about the Society, visit www.sdfhs.org. During the First World War there were over two million British Army casualties. Roughly two-thirds of the wounded returned to active duty, and around 182,000 were discharged as invalids. The flow of casualties from the various theatres of war soon overwhelmed the medical facilities at the Front and back home. When war was declared, Dorset County Hospital in Dorchester was a relatively small infirmary, still run as a charity, as it had been since 1840. It was chiefly funded from sub­scriptions and donations, and treated about 400 in-patients a year. To help the war effort, the hospital offered 120 beds to the military authorities. Captain John Acland, chairman of the management committee, told a governors’ meeting that these were extra beds: “There should be no diminution in the provision made for civilian patients amongst the poor of the county … they should be treated [at the hospital] just as if there had been no war at all”. Acland was a grandson of one of the hospital’s first benefactors, and was mindful of the founders’ original mission to help the poor. It seems Acland’s aim was largely met, but it placed an enormous additional burden on the nursing staff and on the physicians and surgeons of the county who gave their time for free. They were assisted by the Dorset branch of the British Red Cross Society and the local Voluntary Aid Detachments, which pro­vided additional nurses, stretcher bearers and hospital orderlies for the “weary night-watches”. Seventy military beds were in the main hospital building in Princes Street (the building is now a block of flats in Somer­leigh Road). A further fifty beds were at the town’s Masonic Hall and at Colliton House. Another hospital was opened in a private house in Church Street, Dorchester, where the men were looked after by a team of nurses led by Captain Acland’s wife “in her scarlet commandant’s uniform”. The first military patients were not in fact soldiers from the front line, but troops from the army camps at Wareham, suffering from exposure. Soon, however, casualties were arriving from the continent, having landed at Southampton and then carried by train to Dorchester. On a single day in November 1914, 35 wounded soldiers were met at the station by stretcher bearers, and transported to the County Hospital by motor-cars and the hospital’s horse-drawn ambulance (converted to a motor ambulance in 1916). 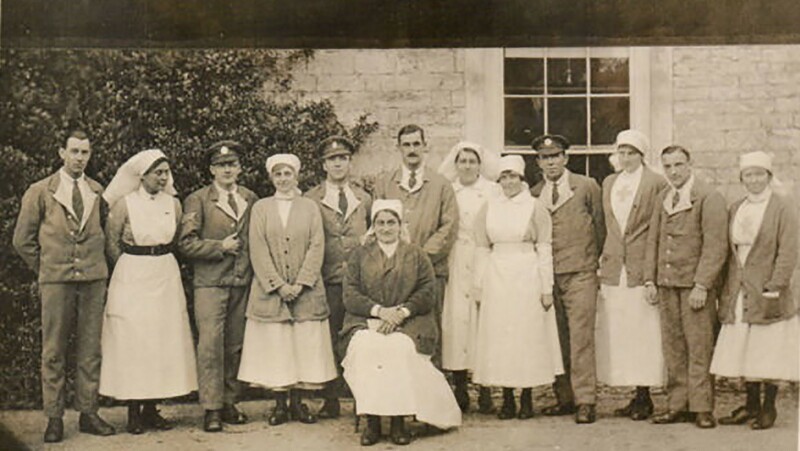 During the four years of war, Dorset County Hospital and its outposts in the town treated 1,949 service men. It was part of an increasingly well-organised chain of evacua­tion bringing injured men from the field hospitals, to the medical stations in the continental ports, to receiving hospitals on the British mainland, and then onward home. … we have been in the trenches again. We went in on Sunday night – the first line – and came out on Wednesday. During the whole time it was pretty quiet, except on the last afternoon, when the Germans took it into their heads to both shell and bomb us. The majority of the shells fell just at the back of our trench, and I am glad to say no one was hit. … The trenches were good ones, and in the dug-outs we could sleep when not on duty. There were dozens of dead Germans in front. They have been there since the big attack, and you may be sure it was not a pleasant sight. … I had an interesting letter from A.J.W. yesterday. He says he hopes I shall see plenty of fun. I have, but it’s fun you get tired of. On 9 May 1915, at the battle of Aubers Ridge in northern France, Stevenson was shot through the hip. It was his second injury, but this time more serious. He was one of more than 11,000 British soldiers wounded that day, the vast majority within yards of their own trench. There were so many casualties at Aubers Ridge that it took three days to move them through the field hospitals. Stevenson was one of the first to be transported. On 12 May he landed at Southampton, from Boulogne, and was brought up to Dorset County Hospital where he stayed until he was transferred in June to a Red Cross facility near Grantham. Due to his injuries, Steven­son never returned to the front line and he was demobilised in 1919. He died, aged 61, in 1956. Dorset County Hospital’s honorary surgeon during the war was also the medical officer in charge of the German prisoner of war camp at Poundbury. In total, the County Hospital treated 25 German soldiers, including 28-year-old Emil Drygalla. In June 1916 he developed acute appendicitis and was rushed to the hospital. Sadly, despite the surgeons’ best efforts, Drygalla died. His impressive funeral ceremony, at seven in the morning, drew a crowd of spectators and the attention of the Western Gazette, which described the procession at length. Their officer first delivered an extempore oration, followed by some prayers, and then a selected party of the Germans, with one of their number acting as conductor, sang a hymn. In the quietude of the morning the unaccompanied singing, resonant and harmonious, was very effective, and formed an impressive feature of the obsequies. The German prisoners marched by the grave in single file, each dropping a handful of earth upon the casket and, as the Gazette noted, “at the close of the service the Germans marched back briskly to their concentration camp”. Four months after the end of war, Captain Acland reported that the hospital was still providing beds and “electrical treatment” to disabled soldiers. The “electrical depart­ment … was started for the soldiers entirely, but would now remain as one of the principle assets of the institution”. When the military wards were eventually cleared the hospital’s managers realised that they had a great deal of spare accom­modation which would benefit the county’s civilian population. In the year after the Armistice, the hospital took 649 in-patients, compared to 419 before the war. 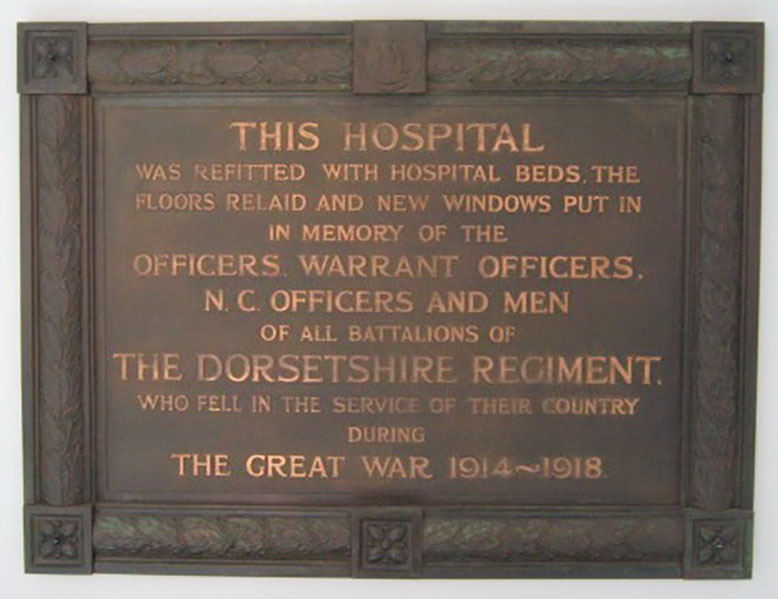 Funds were raised by public subscription to renovate the hospital and endow two beds in perpetuity in memory of the 3,900 officers and men of the Dorsetshire Regiment who died in the war. A memorial placque was unveiled at the hospital in 1925 and can still be seen on the walls of the modern Dorset County Hospital. Information on casualty numbers comes from the very useful website www.1914-1918.net. I am grateful to Dorset County Hospital for permission to take a photograph of the war memorial. The image of Private Stevenson: Image © Johnston Press plc. Image created courtesy of THE BRITISH LIBRARY BOARD. 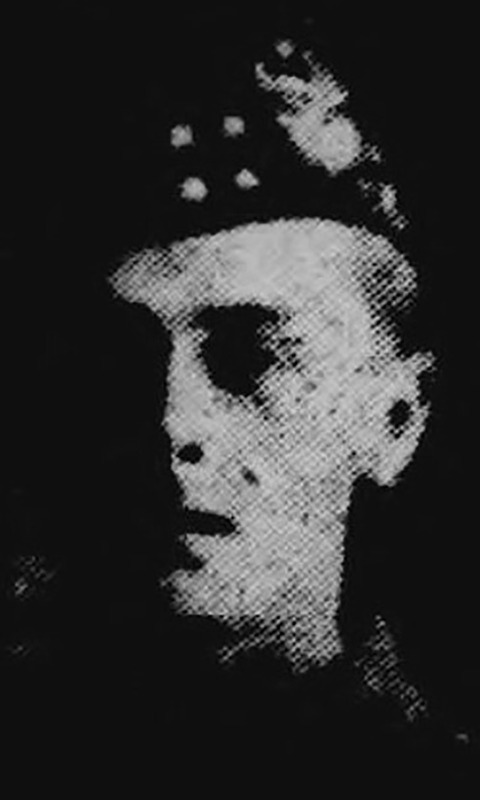 Reproduced with kind permission of The British Newspaper Archive (www.britishnewspaperarchive.co.uk).